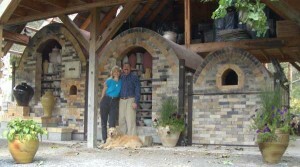 Christine, Robert & “Shino” in front of the wood chamber. Robert wood fires in a large Noborigama that consumes 6 cords of wood over a period of 40 hours of constant stoking. A Noborigama is a climbing chambered kiln. The word “gama” is the Korean term for kiln. “Nobori” means step-climbing . It’s predecessor is an Anagama. The word “anagama” means cave kiln. The Anagama style kiln is a tube shaped kiln, similar to a chimney on it’s side. 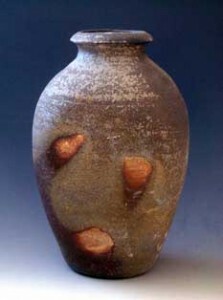 Anagama firing is an ancient method usually done without glazes. Anagama firings are very long, often going on for many days or weeks. The process of burning such a huge amount of wood creates large volumes of ash, which melt to produce a rudimentary glaze surface. During a firing Robert uses a blend of woods including Pine, Spruce, Hemlock, Oak and Maple. Generally speaking softwoods produce a faster hotter firing, while hardwoods aid in keeping a bed of coals in the firebox. Depending on the stage of the firing, stoking may take place as frequently as every 3 minutes. He must pay close attention from the first stoke of wood to the last. In order to reach the 2400 degrees F. necessary for melting the glazes during a firing is dependent not only on the amount of wood burned, but also the timing of each stoke, the size & species of wood, as well as the moisture content of the wood, to makes a successful fire. 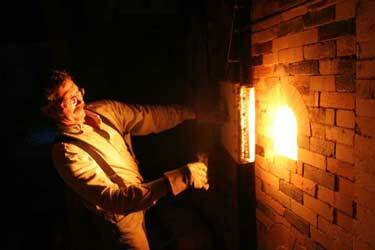 Noborigama kilns were developed when potters began to refine their glazing methods. This style of firing allows for more control of the temperature, and better wares with functional surfaces. 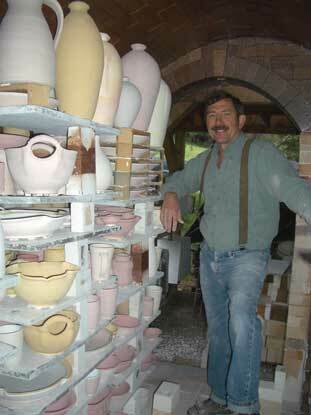 This style kiln is most appropriate for pottery that has glazed surfaces. Wood firing is not the easiest method for producing matching wares. It is best utilized by potters seeking unique & natural process driven surfaces, which result from firing with wood as a fuel. Some potters use wood for ecological reasons, however most choose wood firing because of the effects achieved from fly ash and flashing. 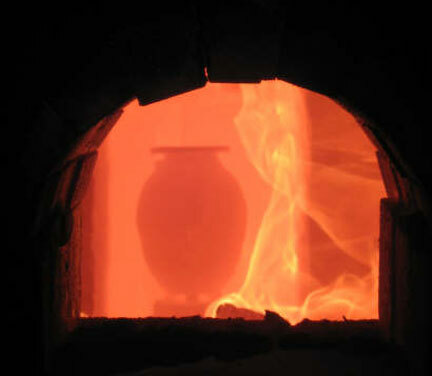 Intensive labor is needed for preparing wood, as well as, maintaining and firing the kiln.